Billy Whitehouse goes up against Brad Dockerty during last night's 2-0 friendly win at Frickley Athletic. 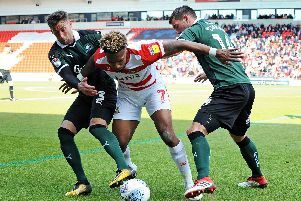 Paul Dickov is hopeful of adding two new signings before Doncaster Rovers jet off for their pre-season training camp in Portugal this weekend. The Star understands Rovers are closing in on a full back from whom Dickov hopes to secure a signature before the club depart on Sunday for the six-day trip. The Rovers boss is also believed to be chasing a wide midfield player and is keen to strengthen further both defensively and in attack. Quality rather than quantity is key to Dickov’s plans and any new additions would have to be of a similar standard to the four players he has already signed. Rovers are unlikely to take any trialists on the pre-season trip, as they have done in previous summers. Dickov is particularly keen that only players who will definitely be at the club next season be present at the training camp. Rovers fielded one trialist in last night’s 2-0 win over Frickley Athletic, believed to be ex-Cheltenham Town defender Durrell Berry. Nathan Tyson scored two second half goals to give Rovers the win from a tough test at Westfield Lane. Liam Mandeville and Rob Jones missed out after suffering slight strains, while Andy Williams and Richard Chaplow were not used. Paul Keegan completed 45 minutes as planned in his first action since early March and came through the test well. Paul McKay, used in defence in the first half and midfield in the second half, caught the eye, while young winger Billy Whitehouse could also be satisfied with his contribution. Rovers jet off to Portugal this weekend for what promises to be an intense training camp prior to friendlies with Nottingham Forest, Middlesbrough, Sunderland and Wolves at the Keepmoat.